The two photographs shown below were taken with a microscope with high-resolution phase-contrast optics. 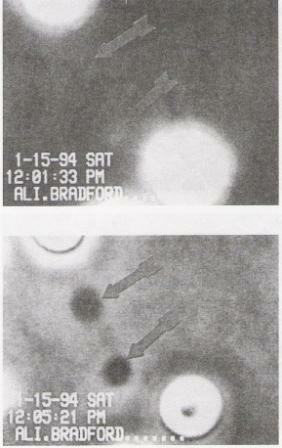 Candida yeast bodies appear as poorly defined bodies in the upper picture (with two arrows pointing to them) and as dark bodies after they are stained with anti-candida antibodies (with two arrows pointing to them in the lower picture. Some text from the legends included in my riginal 1997 paper are included below the photopgraphs. Candida organisms are immunostained Candida organisms in phase-contrast and darkfield fields. In this procedure, human anti-candida IgG antibodies labeled with horseradish peroxidase were used to specifically stain Candida organisms. For procedural details and antibody specificity characteristics.